Chaat Masala - 1/4 tsp. Cinnamon&Clove Powder - 1/4 tsp. Kasuri Methi - 1/2 tsp. 1. 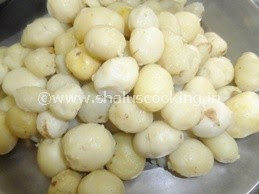 Pressure cook the baby potatoes for 4 whistles and peel the skin. Cut the potatoes into halves if it is little bigger in size. 2. Add all the items listed under "For Marination" in the Ingredients Section into a mixing bowl except the potatoes. 3. Mix it well to make a smooth paste. Add in the baby potatoes to the mixed masala. 4. Mix the potatoes well in the masala and let it marinate for 30 minutes. Heat oil in a pan to roast the potatoes. 5. Add the curry leaves and marinated potatoes. Toss it well. 6. Roast it on medium flame till the potatoes are nicely roasted and the color changes to golden brown. Yummy Tandoori Aloo is ready to serve.